The traditional Christmas celebration involves breaking a period of fasting and the slaughter of animals for the Christmas feast. 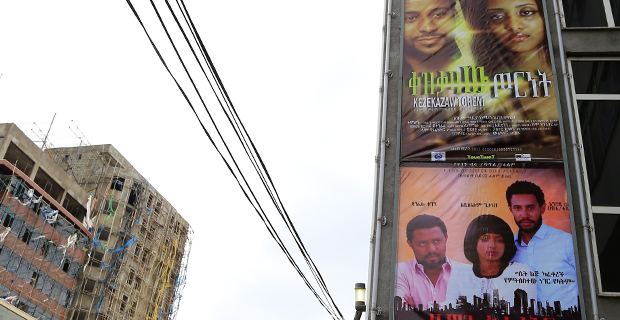 In the run up to Christmas Day, DAWIT ENDESHAW FORTUNE STAFF WRITER explored the cattle market in Addis Abeba and the factors that affect current availability and price. Livestock Market at Kera. These two livestock traders kiss each other's hands as a traditional sign of negotiations in process. The big livestock market found at Kera in Addis Abeba. 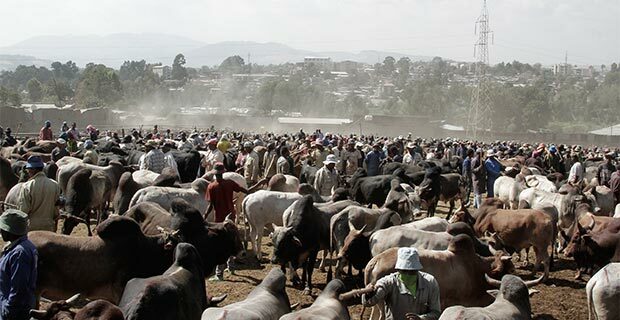 On January 06, 2015, a day before Christmas, the 60-year old cattle market centre at Kera was full of stock from all over the country – Addis Abeba as well as Oromia, Amhara, Benshangul Gumuz and Southern Nations, Nationalities & Peoples’ states. 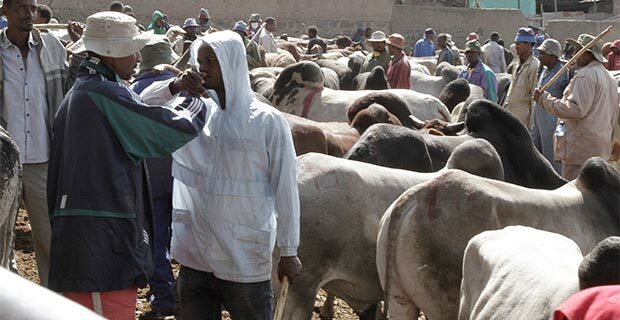 The market is also said to have received more livestock from Amhara, particularly Gonder, over the past two years because of problems with cross-border cattle trade to Sudan. Cross-border trade has declined not just with Sudan but with Somalia as well, as the drought may have contributed to the rising supply of cattle this Christmas. The number of traders however, was said to have declined probably because of the use of receipts, which the government is trying to enforce. Ayenew Alehegn, one such trader, used to have a licence to fatten and export cattle. 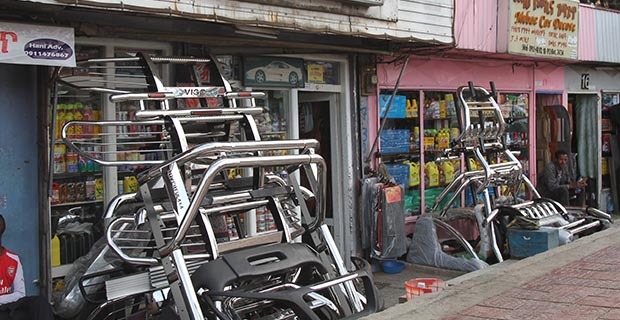 He and many others like him have now given up the export business in favour of the domestic market, he says. 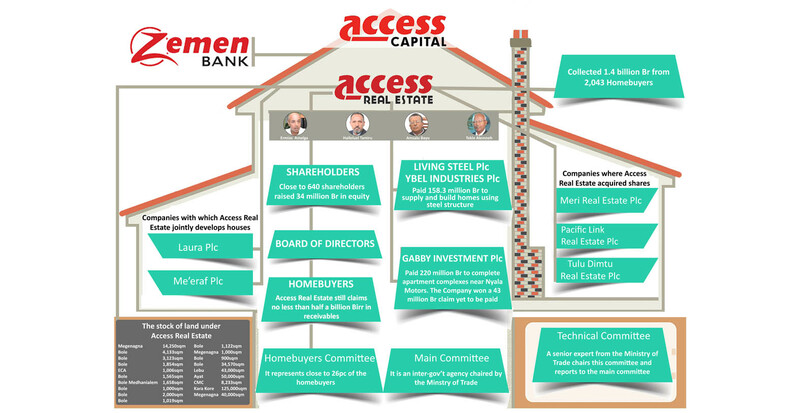 Part of the problem, according to Ayenew, was that the government pushed them to make their sales in American dollars, while the Sudanese buyers offered Ethiopia Birr. “We exchange the Birr into dollars at the parallel market to hand it over to the government,” Ayenew said. However, another part of the challenge was that the Sudanese pound has been stronger in comparison to the Birr, which discouraged the Sudanese buyers, Ayenew and other traders told Fortune. The interest on the side of the Sudanese has been dwindling since 2012, a period during which the exchange rates of the two countries’ currencies were growing wide apart. 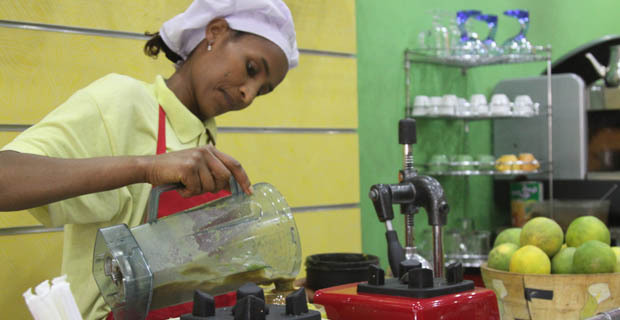 Since then, interest has shifted to the Addis Abeba market for traders from Gonder. These traders get their cattle from Metema, Chilga and Dembia, all in Gonder. Local authorities have recently been urging the traders to start buying from drought affected farmers living in areas such as Bellesa, but the response of the traders was lukewarm because of the higher cost to fatten these animals, the traders say. In Dera Wereda of the Arsi Zone, Oromia, which has also been affected by the drought, a farmer, Demessie Dadi, told Fortune that he sold an ox for 4,000 Br, whereas a similar ox a year ago sold for 7,000 Br. 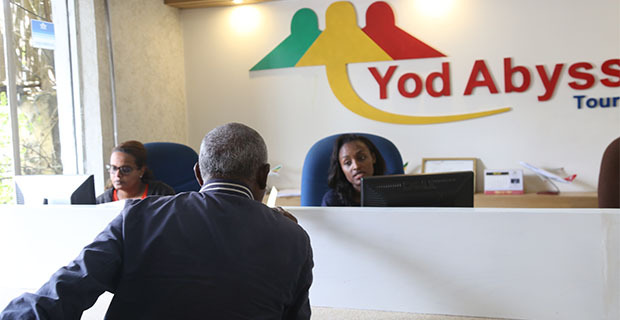 Still the influx of traders from around Gonder has helped stabilize the Addis Abeba market, according to Tekia Gibey, coordinator of the centre, particularly since the total number of traders who used the centre this Christmas has significantly decreased. Traders are charged 10 Br per cattle per day at the 20,500sqm Kera market, in addition to 350 Br charged per truck delivering cattle for the service they get during their stay at the centre. Cattle were available for this Christmas for as little as 4,500 Br and for as much as 28,000 Br, both somewhat lower than a year ago, when a price as high as 35,000 Br was quoted. Traders from Gonder were selling their animals for 5,000 Br to 12,000 Br, while some from Wollega were asking as much as 14,000 Br. All complained about the process having gone down this year by about 2,000 Br to 3,000 Br. 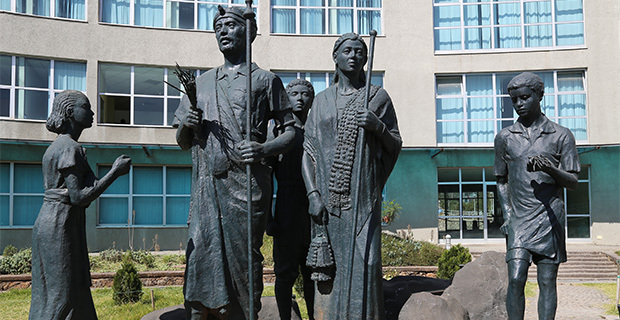 Dola Manushe, resident of Harar and head of the Harar Hulegeb cooperatives told Fortune in a telephone interview that cattle prices were also down in the Harar area because of the drought. Still the ox that had a calling price of 28,000 Br at Kera was the popular Ye Harer Senga, large animals coming from that part of the country. Pricing was not the only issue. That traders are now required to sell cattle using receipts, was among the complaints the traders voiced. But there is irregularity in the implementation of this directive, as some are selling without receipts. For others, the perception is that the tax authorities do not consider the cost traders incur in buying the livestock they sell. Some traders also complained that quality competence to get cattle trade licences is not uniformly required by the authorities. 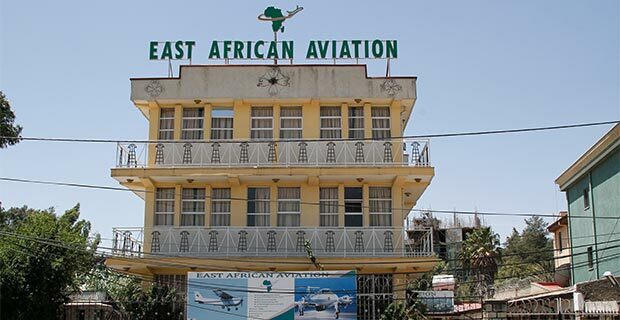 But more in line with the Gonder story, the traders from Harar and surrounding Oromia areas, are also complaining about less cross-border demand from Somalia. For some traders, part of the problem in the sector is the difficulty of getting land for cattle breeding. 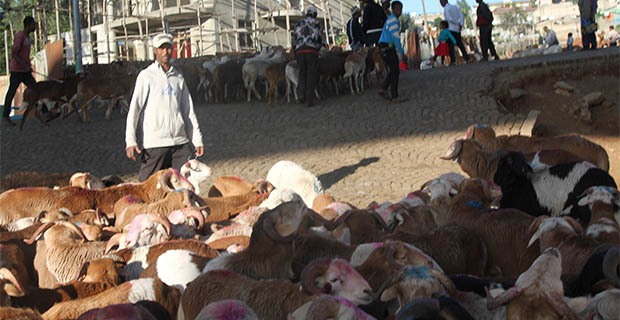 “We have observed that there is a price decrease in each cattle at national level, but this is not reflected by the prices in stores,” said Tsegaye Hailu, head of Addis Abeba Butcheries Association. Nevertheless, the lowered price may explain the high level of activity at the Kera cattle market, reflecting one of the ways in which cattle farmers are responding to the drought. “If it was last year traders would have finished getting their cattle in to the centre by early morning but now there are still more vehicles offloading the herds,” said Tekia, in the late afternoon. Most of the farmers are now preparing themselves for the time ahead, when the food shortage may get worse, forcing them to drive their cattle to the markets,” he added. Central Statistics Agency (CSA) data show that in the 2013/2014 fiscal year, 3.8 million cattle were sold, out of a total population of 55 million heads.